Cognitive Dissidence: This Is What Democracy Looks Like! Leaders of the Oklahoma Education Association on Thursday unveiled the specifics of their demand for $10,000 teacher pay raises and said new legislative talk of $2,000 raises would not stop public school teachers from walking out en masse on April 2. The state’s teachers union proposal calls for a $6,000 teacher raise in year 1 and $2,000 each in years 2 and 3, for a total, three-year cost of $1.46 billion. They also want a raise for school support workers that would cost $292.5 million by the end of those same three fiscal years. tate employees are considering walking out with teachers if raises aren’t forthcoming, the Oklahoma Public Employees Association said Friday. The group’s board of directors is set to meet Saturday to discuss its options and potentially approve a plan to support a state employee walkout. 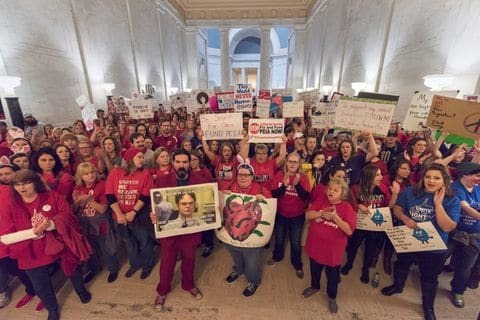 Teachers announced Thursday that they would walk out on April 2 if lawmakers failed to come up with a plan for $10,000 pay raises. State employees’ pay shrinks each year, and they are fed up with lawmakers who will not listen, Zearley said. The organization has about 10,000 members among Oklahoma’s roughly 34,000 state employees, he said. As we say here in Wisconsin, "This is what democracy looks like!" Personally, I'd like to see this movement spread nationally and rapidly. Not only that, I'd like to see private sector workers, especially those in the misnamed Right to Work states, to stand up and demand their rights as well. The big businesses and corporations, and the politicians whom they own, will not give the people their rights or treat them with respect out of the goodness of their hearts. These things only come when the people demand them and are willing to fight for them. But even now, these actions warm my heart and give me hope for our futures. Solidarity, brothers and sisters. More of us are standing with you than you realize. Those at the top of the food chain will always demand concessions from those lower than themselves. You are demanding Solidarity - in what? Exploding a lower class to finance/ fund/feed and nourish YOUR class. Is you class - the Solidarity Class "better" than the other classes? Perhaps so - or as you impress. When the Surplus Energy runs out - I'll meet you on "the other side"